Cast Aluminium Bowl and trays with Mosaic of Bone with Mirror polish also available in recycled material. Mat finish, nickel finish etc. Packing can be done as per buyers request and labelling can also be customised. We offer to our client’s Aluminium Casting filter plates with accessories, which are extensively, used in municipal & industrial filtration markets. Our team of experienced engineers and allied professionals effectively use professional designs, high quality raw material and innovative technology in its manufacturing processes. To meet the dynamically increasing demands of the customers, we are offering a wide array of Cast Aluminum Plate. The Cast Aluminum Plate we offer is widely used for their corrosion resistance and usability in various industries. Moreover, our Cast Aluminum Plate is available as per the needs of the customers. 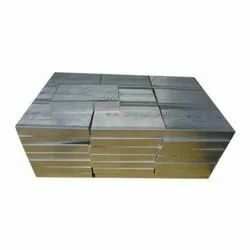 - Thicknesses: 0.25" thru 2.5"
To fulfill the varying and rising needs of patrons, we are engaged in offering a large range of Aluminium Cast Plate. This Aluminium Cast Plate is used for welding fixtures, assembly jigs and many more applications. Our Aluminium Cast Plate is dimensionally curate and known for their durability. Our company has gained name and fame in presenting Aluminium Casting Plate. Backed by rich industry exposure and highly equipped infrastructure, we are engaged in offering an extensive range of Casting Plates to the clients. These are manufactured as par with the market set standards and quality guidelines. G.AL® C250 ELOX PLUS has been developed for optimal anodizing quality. Due to a very special casting procedure with pre-cleaned melt and a following homogenization we developed a superior anodizing quality. We have tightened controls in regards to chemical and physical properties of the output material. The Best of the Best MIC 6® Aluminum Cast Plate is a blend of the most desirable features of many individual metals. The result is a cast aluminum plate that meets the challenge of product accuracy demanded by today's industry. MIC6® Aluminum Cast Plate is a blend of the most desirable features of many individual metals. The result is a cast aluminum plate that meets the challenge of product accuracy demanded by today's industry.